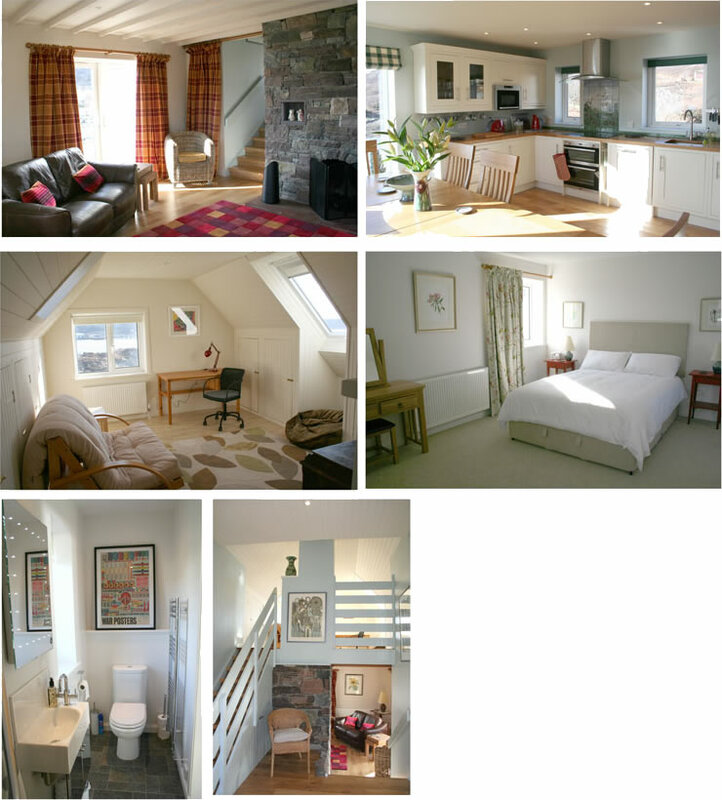 If you fancy a trip to visit us, why not stay in one of our self catering holiday cottages in Lochinver and Ullapool. Bedroom with king size bed, and en-suite shower room, 3 in 1 duvets, clock radio with CD, hair drier. Bedroom with twin/super-king bed option, 3 in 1 duvets, clock radio with ipod dock. Living Room with Oak floor, TV with Freeview and DVD, leather sofas and open fire ( coal and logs provided), opens on to a patio with clear outlook to the sea. 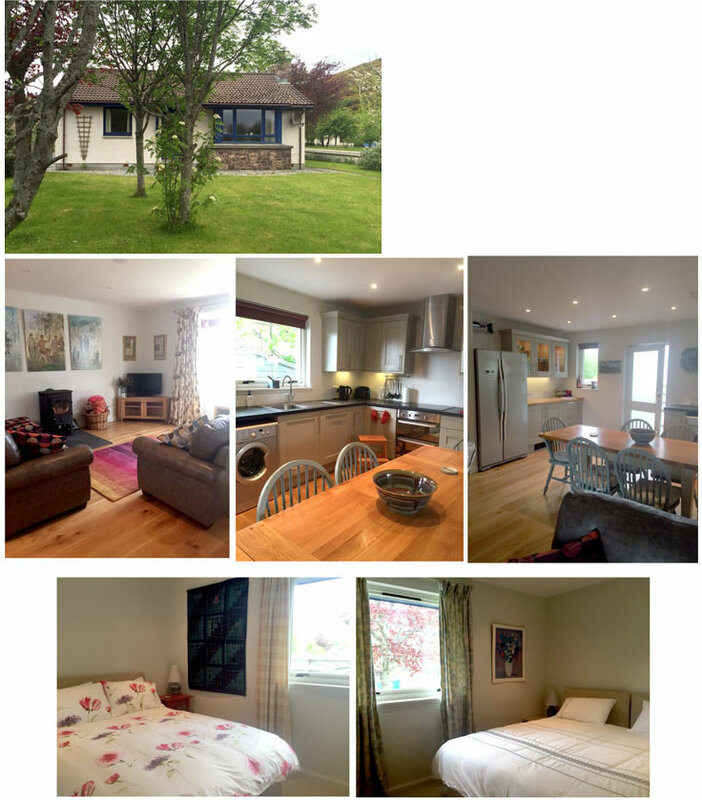 Large, well equipped kitchen with dining area, looking over Lochinver Bay, oak floor, American fridge/freezer with ice-maker, dishwasher, laundry facilities, radio with CD player and ipod dock. Fresh herbs can be picked from the garden. Travel cot and high-chair available on request. Available from 4pm Sat, vacate by 10am following Sat. Booking only confirmed with non refundable deposit 30% of rental. Balance due 6 weeks before arrival date. Major Credit Cards accepted. Any damage will charged. The house has been superbly decorated, with original art (some by our visiting artists) throughout, and, of course, uses lots of Highland Stoneware. You will receive a complimentary discount voucher, to use on purchases from the pottery, valid for the duration of your stay. This is true luxury – we all want to move in !! If you don’t want to dine in every evening, there is a wide selection of eating places to choose from, ranging from a Michelin Star restaurant to a fish & chip van, all of excellent quality. Surrounded by stunning scenery, there are beautiful unspoilt beaches, good hill walking, access to fish hundreds of trout lochs, bird watching and drawing. Ideal for out-door activities, but if the weather is bad, the house offers a safe haven to watch the weather from a cosy viewpoint! Please contact house@highlandstoneware.com or click here for availability. or Tel: Jennifer on 01571 844190 for more details or to book. Seasonal prices £375, £475, and £575 for weekly lets (including VAT). Bedroom with double sizebed, 3 in 1 duvet, radio , hair drier. Bedroom with twin/super-king bed option, 3 in 1 duvets, radio. Open Plan Living Room/ Kitchen Dining with Oak floor, TV with Freeview and DVD,leather sofas and wood burning stove (logs provided). Well equipped kitchen with dining area. Washing Machine, Tumble Drier, Dishwasher. If you don’t want to dine in every evening, there is a wide selection of eating places to choose from, all within easy walking distance. Surrounded by stunning scenery, there are beautiful unspoilt beaches, good hill walking, bird watching and drawing. Easy walking distance from sports centre, swimming pool and local shops and restaurants. Ideal for out-door activities. or contact: Jennifer on 01571 844190 / house@highlandstoneware.com for more details or to book.